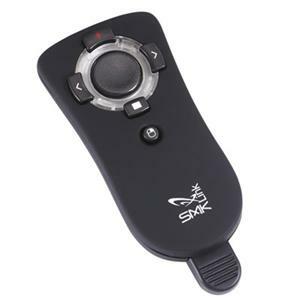 As a presentation remote control, SMK-Link's Pilot Pro presentation remote control is designed as a PowerPoint and Keynote remote, featuring slide advance, retreat and hide buttons, laser pointing, as well as complete mouse control. There's no complicated setup or software to install, just plug in the USB receiver, pick up the Pilot Pro and start presenting. It's that easy. Its 50 feet of radio-frequency range provides freedom of motion for audience interaction during a presentation. This innovative remote ensures that control is at your fingertips wherever you stand in the room. With such a complete set of features, Educators agree that Presentation Pilot Pro is key to good presenting.